Capt. Bennie is the CEO and Lead Instructor of Capt. Roy's. September 1, 2013 he took over the day to day operations of Capt. Roy's. He holds a 25 Ton Master's, near coastal license with Commercial Assistance Towing. He has brought with him a great deal of experience on Power Vessels and holds a degree in education. Capt Bennie, for the last 10 years, has also been co-host of the Sports Radio 610 Outdoor Show and has been featured speaker for several seminars and organizational events. Fishing professionally for several years, he participated in Gulf Coast Troutmasters Series, Oberto Redfish Cup Series, IFA Redfish Tour and FLW Redfish Series. In 2007 he won the FLW Redfish Series Championship held in Orange Beach, Alabama. He is a current member of Coastal Conservation Association, The Power Squadron and The Galveston Bay Foundation. In addition to his on the water experience, he has many years teaching experience in the classroom. Captain Bill holds a 50 Ton Masters Near Coastal with the Auxiliary Sail and Commercial Assistance Towing endorsements. He has been operating his own boats, ranging from bass boats to 30 foot sailboats, since the early 1970s and has extensive experience operating larger sailboats since the 1990s. He holds a Masters Degree in Education and has been involved in adult education since 1980 and is currently an adjunct instructor of education at Sam Houston State University. 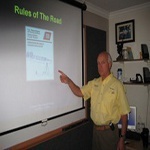 Captain Bill's drive to �Make a Difference� in the classroom adds another dimension to his teaching style. Capt. 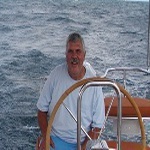 Rick Fisher holds a Masters license with Commercial Assistance Towing and Auxiliary Sailing Endorsement. Capt. Rick has a great deal of experience on both Power and Sailing vessels, which he enjoys sharing with his students. He is a certified instructor with the U.S. Power Squadron, and is a Texas Parks and Wildlife Department certified boating safety instructor. Rick is also a marine surveyor and member of both the Society of Accredited Marine Surveyors (SAMS), and the American Boat and Yacht Council (ABYC). Capt Joe Burrell holds a 50 Ton Masters Near Coastal License with Auxiliary Sail Endorsement. Capt Joe has extensive experience with both sailing and power vessels up to 45' and has made several Gulf of Mexico crossings. Having attended SUNY Maritime Academy, he brings considerable knowledge and expertise along with exceptional teaching experience to the classroom and is a great addition to Capt Roy's staff.